New Delhi, Jan 26, 2017: The Reserve Bank of India may allow citizens another chance to deposit the scrapped Rs 500 and Rs 1,000 banknotes but the exchange would be for a limited sum, sources in the government and banking sector said on Wednesday. The central bank has been flooded with queries and requests from people who failed to deposit all their money by the December 30 deadline, seeking relief, sources said. Many people were discovering old currency notes tucked away somewhere. Interestingly, one of the queries was from a person who found a Rs 1,000 bill in a book. If allowed, deposits would only be for smaller sums to ensure that the window, which will be for a limited period, was not misused, sources said. A government official said the amount expected from this window was minuscule. 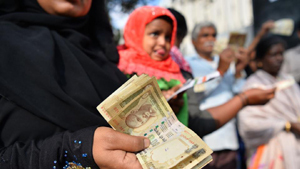 The government had set December 30 deadline for depositing junked bills in banks when Prime Minister Narendra Modi on November 8 announced the recall of the two high-value notes that accounted for 86% of the cash in circulation. People can deposit old notes but only at RBI offices. They have to give a valid reason for missing the December 30 deadline. The RBI deadline ends March 31. The demonetisation decision, aimed at fighting black money and fake currency, sucked Rs 15.4 lakh crore out of the system. The entire amount has come back into the banking system though the expectation was around Rs 2.5 lakh crore would not come back. It would have reduced the central bank’s liability, leading to a higher surplus for the exchequer. It would have also given the government headroom to spend on welfare schemes to ease the cash pain brought by demonetisation. Will the bank accept it without any documents .